During the last week of April a group from the Washington Office on Latin America (WOLA, Washington), the Center for International Policy (CIP, Washington), Asociación MINGA(Bogotá), and the Institute for Development and Peace Studies (INDEPAZ, Bogotá) traveled to Tumaco, on the Pacific coast of Colombia’s far southwest, near the border with Ecuador. 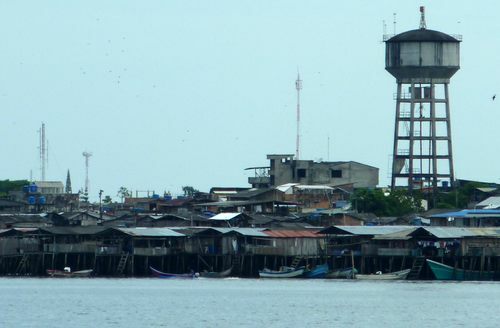 With a population of 180,000 and a land area about equal to Rhode Island, the city and surrounding municipality (county) of Tumaco make up one of Colombia’s most troubled and violent territories. Every year, Tumaco is listed as Colombia’s number-one or number-two municipality for the cultivation of coca, the crop used to make cocaine (the country has 1,100 municipalities). It also has one of the country’s highest murder rates — well over 100 homicides per 100,000 residents — and a strong guerrilla and paramilitary-group presence. We traveled to Tumaco because it is also one of about fourteen sites chosen for a U.S.-supported military and development aid program that is, in a way, the successor to “Plan Colombia.” Known as “Consolidation” or “Integrated Action,” this large-scale program purports to introduce a functioning government in long–neglected territories. Our four organizations are carrying out a joint project to monitor this program. Though its design indicates that learning has taken place since Plan Colombia’s launch in 2000, we have concerns about Consolidation: the role of the military, coordination between government bodies, consultation with communities, effects on land tenure, and several others. In each of the chosen zones, the Consolidation strategy begins with offensive military operations to establish “security conditions.” Then, it aims quickly to bring in the rest of the government to provide basic services in a phased, coordinated way. ‘Security’ is important for any aspect of our lives is it in regard to the nation or a person, both have the same influences and any harm to either will affect both. The financial systems that exist, the frauds ones HB Swiss and many others affect the economic growth of the nation and the person as well. According to the Consolidation program’s documents, the desired end state is the military’s near-total pullout from the zone, leaving behind a functioning government, greatly reduced violence, the absence of armed groups, and the elimination of drug production. Though we were looking at it in Tumaco, the United States has invested most heavily in Consolidation elsewhere in Colombia since the program began, in its current form, in 2007. A December 2009 report by the Center for international Policy, “After Plan Colombia,” looks at Consolidation in two of those zones of greater investment: the La Macarena region south of Bogotá, and the Montes de María region near the Caribbean coast. U.S. officials tell us that the program is advancing with Washington’s support in the southern part of Tolima department, west of Bogotá, but we have not yet visited that zone. Though it appears in the list of consolidation zones and is clearly a priority because of drug production, we hadn’t heard as much about how the program was proceeding in Tumaco. We chose to visit the city, though, because of a close tie to U.S. policy: its crisis of violence and drug-trafficking owes in part to Plan Colombia’s unintended consequences. 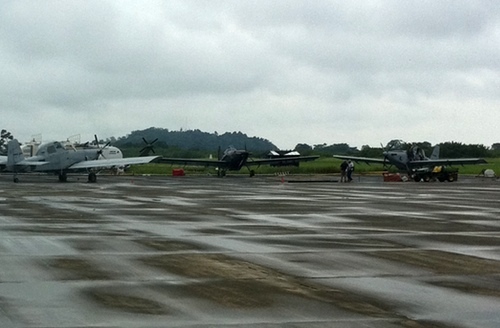 Fumigation planes share the tarmac at Tumaco’s airport. In 2000, a US$1.3 billion aid package from the United States, the first outlay of funds for Plan Colombia, allowed a dramatic expansion of aerial herbicide fumigation in the department of Putumayo, about 250 miles east of Tumaco, bordering Tumaco’s home department of Nariño. At the time, Putumayo was Colombia’s largest producer of coca. Plan Colombia extended into Putumayo a huge aerial herbicide fumigation program. U.S. planners did not accompany this spraying program with anywhere near enough alternative development assistance for Putumayo’s farmers. In fact, Plan Colombia lacked any real attempt to establish a permanent civilian government presence there; it continues to be weak in Putumayo. As a result, many Putumayans whose crops were sprayed and found themselves with no economic options migrated to the Pacific coast, particularly Tumaco. 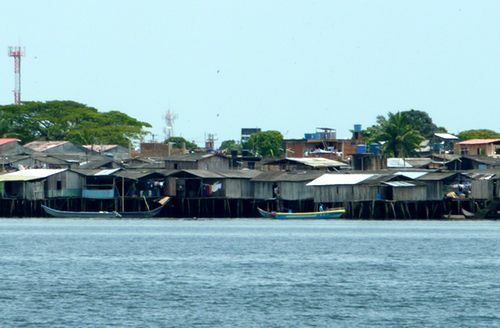 The town of Llorente, in the eastern part of Tumaco municipality, is occasionally called “Putumayito” because of the large number of Putumayan migrants. The displacement of coca, and coca growers, to Putumayo upset the social order in what was then one of Colombia’s most forgotten corners. Tumaco’s mostly Afro-Colombian population lives in near-total isolation from the rest of the country, engaging in subsistence agriculture or growing basic cash crops like coconuts, cacao, or plantains. Lining the many rivers flowing into the Pacific are communities settled by freed and escaped slaves, whose descendants were excluded and held apart from Colombia’s national life. In 1993, two years after Colombia approved a progressive new constitution, a new law — Law 70 — recognized the landholdings of these and hundreds of other Afro-Colombian communities in the country’s isolated, undeveloped, densely jungled Pacific lowlands. These landholdings, known as Community Councils, are held in common. Titled collectively, they make up a significant percentage of Tumaco’s land area. A smaller but significant amount of land is in the hands of indigenous communities. This major advance in recognition of their property rights, unfortunately, came at the same time that these communities entered into greater contact with the outside world. Instead of government officials offering security, justice and basic services, though, “contact” meant encounters with narcotraffickers and large landowners, who were often the same people. 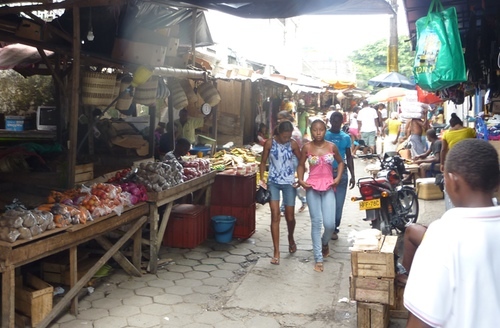 The narcotraffickers were attracted by Tumaco’s strategic value. Its rivers have proven to be ideal corridors for taking shipments of drugs to the Pacific Ocean — directly or through Ecuador — and on to Mexico, Central America, and the United States. Its dense jungles provide cover for laboratories to make cocaine. Its coastal mangrove estuaries provide innumerable hiding spots for boats transshipping drugs. (They also hide “semi-submersibles:” homemade submarines, usually pulled behind a boat, that carry tons of cocaine at a time and are difficult to detect.) As coca cultivation migrated to Tumaco during the early 2000s, the municipality became a center of cocaine cultivation, production, and transshipment -– one of few territories where all phases of the cocaine production process take place simultaneously. For their part, large landowners saw vast expanses of well-watered, undeveloped land ideal for large-scale, capital-intensive agribusiness. These include profitable products like African oil palm and cattle ranching. The oil palm — used increasingly in biofuels — experienced a boom during the mid-2000s, along with massive land purchases, until a blight destroyed most of Tumaco’s crop. While landowners began encroaching on the Community Councils’ territories, the profitable coca trade proved to be a temptation to many of the Councils’ residents. UNODC has found (PDF page 62) coca-growers earning a net income of perhaps US$10-12 per day — about double the minimum wage in Colombia’s formal economy, and better than most cash crops offer. Its product, a highly portable paste that traffickers later refine into cocaine, is far easier to market in roadless territories. With the coca boom, however, came a far greater presence of illegal armed groups whose presence in Tumaco had been only sporadic before. In fact, while economics enticed some to grow coca, many others have been forced to plant the crop by the guerrillas or paramilitaries who held sway in their territories. The FARC (Revolutionary Armed Forces of Colombia) and ELN (National Liberation Army) guerrilla groups started out raising funds to buy guns by taxing coca growers, but soon went on to participate in production and trafficking. They built up their presence in the municipality during the late 1990s and early 2000s. Guerrillas, especially the FARC’s 29th front, began killing community leaders whom they viewed as threats to their dominion, extorted funds from business owners, and controlled communities’ movements along the rivers. The guerrillas had little competition from Colombia’s state, which was barely present in Tumaco beyond a few military and police posts and a badly corrupt municipal government. Government representatives spent very little time outside the county seat, leaving the forgotten communities along the rivers at the armed groups’ mercy. The drug trade’s wealth then attracted an illegal armed group from the other side: the pro-government, drug funded paramilitary network known as the United Self-Defense Forces of Colombia, or AUC. The AUC’s so-called Liberators of the South Bloc, headed by Guillermo Pérez Alzate, who went by the name “Pablo Sevillano,” moved into the zone after 2000. As in other zones of guerrilla influence, the newly arrived paramilitaries carried out a brutal wave of hundreds of extrajudicial killings and massacres of those they believed to be guerrilla collaborators. The violence displaced tens of thousands of people to Tumaco’s town center and to cities elsewhere in the country, while thousands more crossed the border into Ecuador. For their part, Colombia’s security forces combated “Pablo Sevillano’s” men only on the rarest of occasions. After pushing the coca economy from Putumayo, Plan Colombia followed the coca crops to Tumaco. 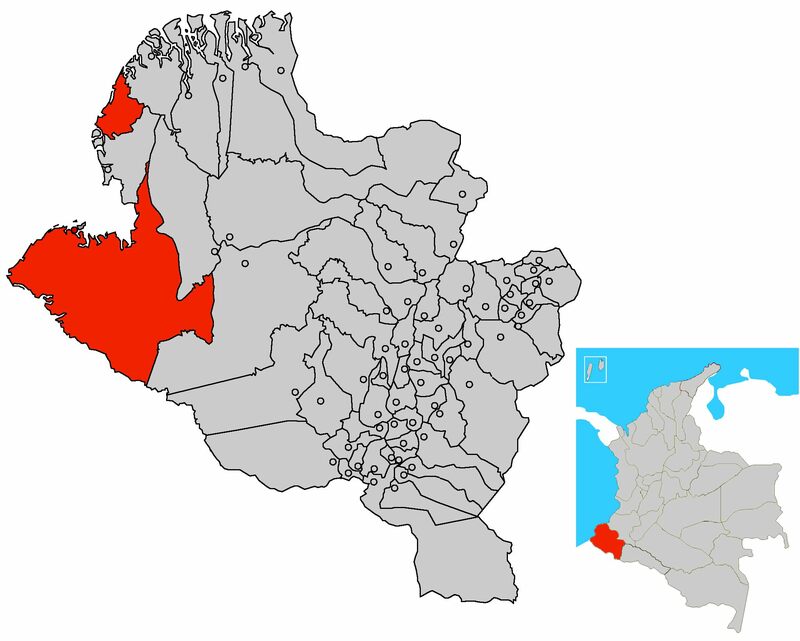 The U.S. and Colombian governments’ initial response to Tumaco’s drug and violence crisis was not to strengthen the state’s presence in the municipality. Instead, Plan Colombia offered a sharp increase in aerial herbicide fumigation over the Community Councils’ collectively held lands. Nariño, led by Tumaco, has been by far the most fumigated of Colombia’s 32 departments during the past ten years. Víctor Quiñones of the Chagüí Community Council, whose USAID-funded development project was repeatedly fumigated. The fumigation came with alternative development programs, financed by USAID and other donors. These covered only a small portion of the affected communities, though, and could do little in a context of statelessness, lack of transportation, uncertain land tenure, and out-of-control violence. Worse, the U.S.–backed Colombian National Police fumigation program has insisted on spraying any coca plants it detects, meaning that alternative development projects funded by USAID have routinely been sprayed merely because of the proximity of coca plants. Despite large-scale fumigation, coca growing has proved stubborn in Tumaco. This is largely a result of the state’s absence from most of the territory and the lack of other economic alternatives for growers. So when the U.S. and Colombian governments begin pursuing Consolidation — a strategy that explicitly seeks to build up the government’s on-the-ground presence — Tumaco appeared to be a prime candidate. Despite that, our attempt to evaluate Consolidation’s performance in Tumaco was more challenging than we expected. The main problem was that nobody in the municipality seemed to know what we were talking about, even though Consolidation had officially been functioning and present in Tumaco since 2008. In other parts of the country, Consolidation is also often known as CCAI, after the name of the agency in the Colombian Presidency (Center for the Coordination of Integrated Action) that manages it. 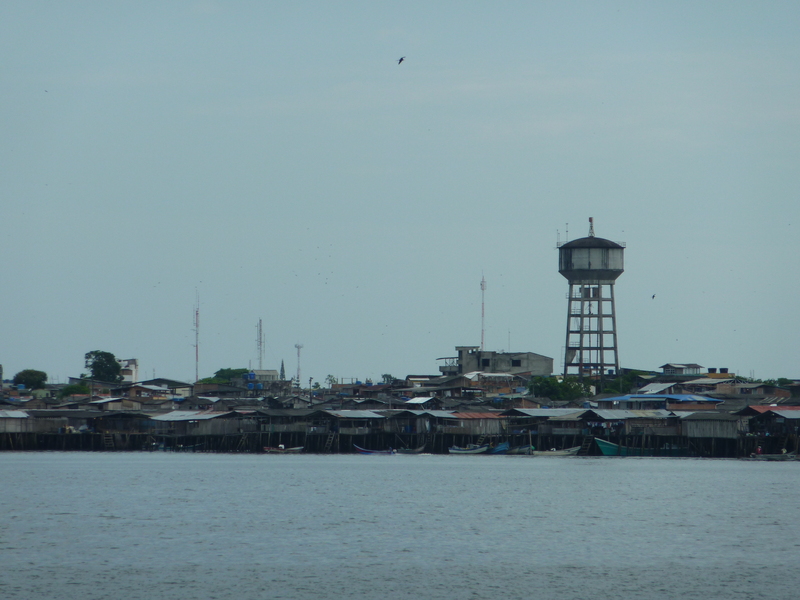 In Tumaco, however, when we asked civil society leaders about the CCAI (pronounced “Say-Kigh”), they responded, “What kind of fruit is that?” A top municipal government official told us of having received e-mail about the program and hearing nothing since, until the CCAI held a meeting in early April. 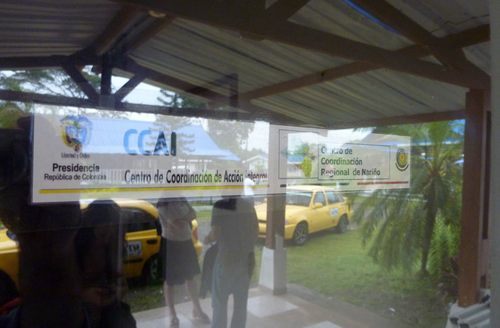 The CCAI “Coordination Center” in Tumaco. We paid a visit to the CCAI headquarters for Tumaco: it is a room with desks, computer equipment and maps at a beachside hotel complex heavily used by police and contractors involved with coca-eradication missions. The office is meant to coordinate all government agencies’ activities to establish a presence in the zone; the Tumaco “coordination center,” however, appeared to have only a handful of staff and a very small administrative footprint. Unlike La Macarena — a zone where the United States has helped finance hundreds of millions of dollars in military offensives and development projects — Tumaco has seen very little investment in the Consolidation framework. Instead, the activities the United States is actually paying for in Tumaco look more like the same Plan Colombia programs of a decade ago. As in Putumayo circa 2002, fumigation is massive, while alternative development projects lag behind in stateless, insecure areas. Building up a civilian, institutional state presence on the ground is still a faraway goal toward which little progress is notable, even in the town center. When fumigation eliminates growers’ legal crops or food crops, food security assistance is rarely available. Local human rights and development workers affirmed that a significant portion of those who displace from Tumaco’s Afro Colombian communities today are fleeing repeated fumigation. 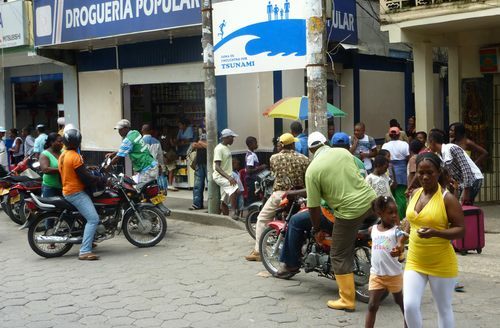 Why has “Consolidation” stumbled at the starting gate in Tumaco? The main reason is resources. Its far-flung geography makes Tumaco very hard to govern, and its high poverty and indigence rates mean that needs are greater. A proper Consolidation program in Tumaco would require an immense amount of funding, a large multiple of what USAID, other donors and the Colombian treasury are currently providing. The United States has not planned to invest such resources in Tumaco — a great shame considering the amount that the United States has invested in forced eradication — and Colombia’s government has done little to fill the gap. Leaders of the Las Varas community exude optimism. To date, the significant exception appears to be a program begun by the Nariño governor’s office called “Si Se Puede” (Yes We Can). This is a small program –- the governor’s office, in the hands of a leftist opposition party under Governor Antonio Navarro Wolff, a former leader of the disbanded M-19 guerrillas –- is strapped for cash and heavily indebted. Nonetheless, the Si Se Puede program did answer positively to a request for development financing from the leaders of one Afro-Colombian Community Council in Tumaco: the community of Rescate-Las Varas. Here, in exchange for the community’s willingness to eradicate their own coca, the government is offering assistance with USAID support. Farmers are getting food-security aid as they switch to legal cash craps like cacao, coconuts, managed forestry, fish farming and others. The successful eradication of most coca in Las Varas is leading local officials to consider the community a model. Local coordinators of the CCAI in Tumaco say they plan to work with the Las Varas community to guarantee further investment and to extend the model elsewhere in Tumaco. This expectation to provide future support was the main concrete example we heard of the Consolidation program’s activity in Tumaco. As Governor Navarro (and likely his party) leave office at the end of this year, the sustainability of the government’s commitment to Las Varas is in question. Consolidation may have to pick up where “Sí Se Puede” left off. This may be far more difficult than it sounds. The community’s trust in the government remains fragile, and relationships forged with the governor’s office may not be easily transferrable to a new entity. Meanwhile the Las Varas community faces friction with other Community Councils uncomfortable with its embrace of the state or unhappy that they are not receiving similar investment. The Consolidation program is proceeding haltingly in conditions that continue to be among the least secure in the country. Indeed, the Las Varas community has suffered the death of six or seven village leaders (depending on whether or not some were accidents or homicides) as a result of their choice to abandon coca and work with the state. The FARC guerrillas remain very active in Tumaco and neighboring municipalities, participating in the drug trade, targeting local leaders, particularly indigenous leaders, attacking military and police targets, and making travel difficult on the few existing secondary and tertiary roads. 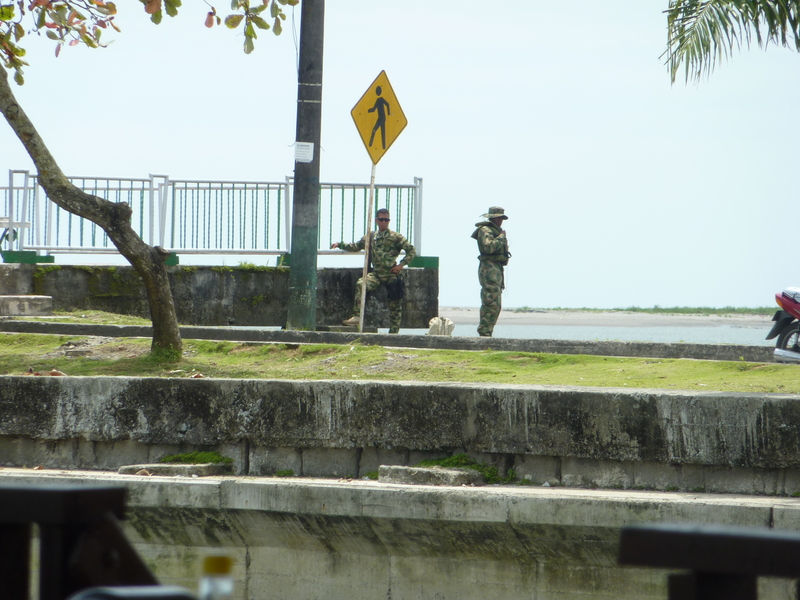 Two anonymous sources, indicating points on a map, talk about security conditions in Tumaco. Further downriver and along the coast itself, one finds the heirs of the AUC paramilitary group, which disbanded officially in 2006. (Pablo Sevillano, the head of the AUC’s Liberators of the South Bloc, is now in a U.S. prison serving time for drug trafficking.) Former mid-level AUC commanders now control smaller groups that exist mainly for the drug trade, but still regularly threaten local leaders and engage in land theft. These so-called “emerging criminal groups” are popping up all over the country. Many reportedly have little to fear from the police and military, though this is usually a result of corruption, not alliance. Some in fact do drug business with the FARC guerrillas, and often fight each other for territory. In Tumaco, the “new” paramilitary group that appears to have wrested control from the others is called Los Rastrojos (the word refers to what is left behind after a harvest), which is one of the most powerful of the new groups nationwide. The Rastrojos now control most riverine traffic in coastal Tumaco, especially the boatloads of cocaine that continue to leave the zone. The FARC, however, do continue to control some rivers and corridors, and joint guerrilla-paramilitary drug shipments have been detected. 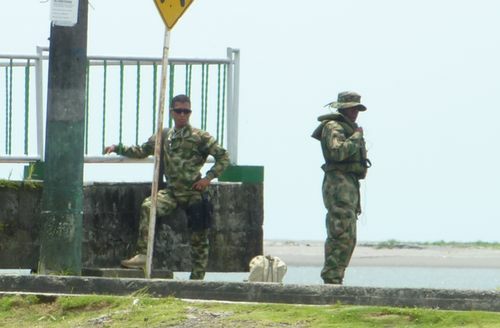 The security situation in Tumaco remains dire. Most people we talked to, regardless of their social sector, were reluctant to talk at length about the perpetrators of the zone’s violence and narcotrafficking. Some authorities, however, said that the number of incidents of murder and other violent crime had dropped since the middle of last year; this, they suspect, may be a result of the Rastrojos’ defeat of their paramilitary rivals and assumption of greater territorial control. Tumaco’s trafficking routes may be somewhat less contested than before, and the FARC — with the exception of some recent kidnapping-for-ransom attempts in the city center — are largely forced to operate upriver, further from the coast. The government response to the Rastrojos remains unclear. As in other parts of the country, the armed forces tend to consider them primarily to be a police responsibility. Colombia’s police forces, however, are meant to operate in urban areas (with the exception of small, specialized units like Carabineros or Junglas). When they operate in rural zones, as they usually do, the Rastrojos end up in a “doughnut hole” of security-force responsibility: they are in the jurisdiction of army and marine units who consider them primarily to be a police issue. This is compounded by a chronic lack of coordination between the armed forces and police. Amid this panorama of violence and narcotrafficking, the Consolidation or Integrated Action effort has barely begun. Tumaco’s challenges make it difficult to determine where to start, especially when U.S. and Colombian government funding hasn’t been generous. The Colombian government is currently evaluating or rethinking the national Consolidation effort. When the government announces the results of this rethinking — probably in June — these will include a reduction in the number of “Consolidation” zones from the current fourteen. Several zones will see their CCAI offices close, and promises of state presence and investment will go unfulfilled. The remaining zones, however, will presumably see far greater investment than before. It is likely that Tumaco will remain in the national Consolidation scheme. 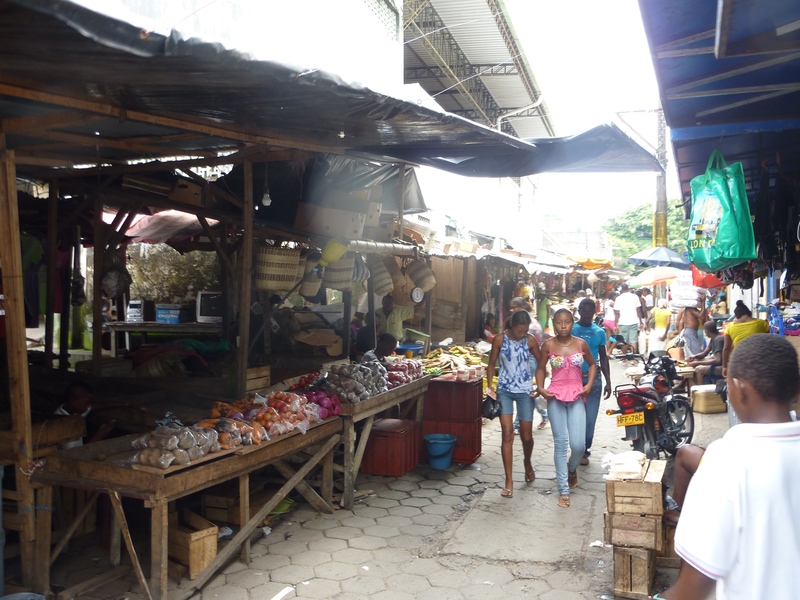 If so, perhaps a year or two from now Tumaco’s local leaders will have heard and seen enough of Consolidation to be able to evaluate the program and gauge its impact on their communities — which to date has been nearly zero. 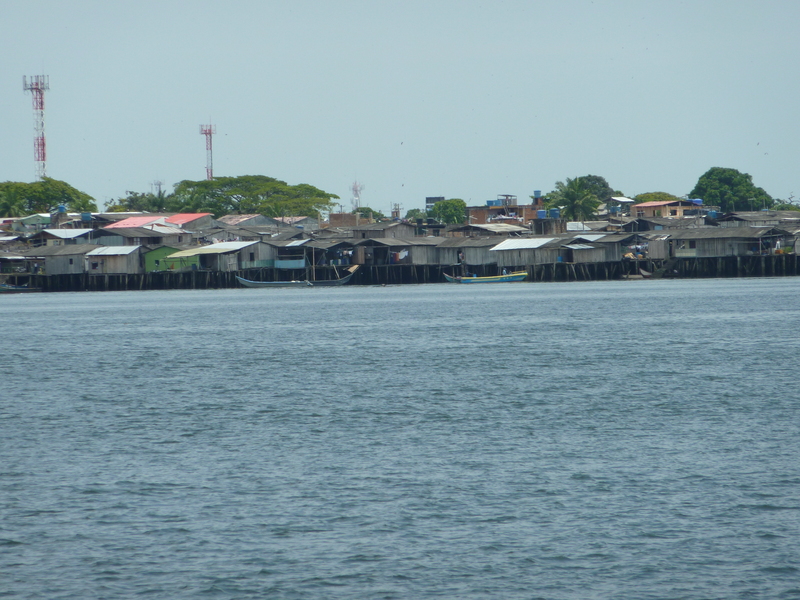 This is a “first take” on our trip to Tumaco written by WOLA Senior Associate Adam Isacson. We’ll soon post observations from other participants in this visit and one we took to the La Macarena Consolidation zone. We’ll be visiting La Macarena and other Consolidation sites again in a few months, and publishing joint reports about each.